In our new feature, Why Is This Commercial?, Noel Murray explored DirecTV’s utter distaste for cable. One of our newest features, NOT OPTIONAL, received the video treatment this week. Snuggle up with a can of Diet Dr. Thunder and enjoy some of our can’t-miss entertainments. HBO’s Enlightened is one of the best shows on TV right now, and if you want it to get the third season it deserves, now’s the time to tune in. The Gaslight Anthem’s Brian Fallon told us how Weezer’s “Hash Pipe” was the sound of the band giving up by writing lyrics that were both meaningless and unintelligible. 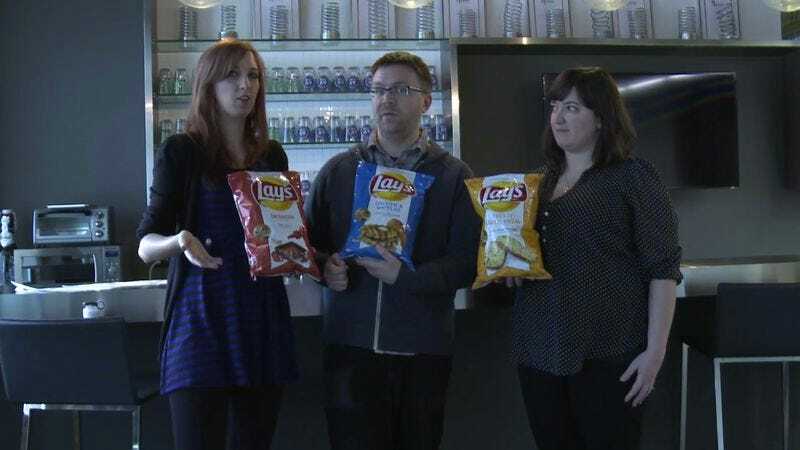 We did our first Taste Test in the brand new Taste Test Laboratories where we sampled the Lay’s Do Us A Flavor chips. A few of our staffers explained how movies taught us how to have a fun time during Spring Break. “Woo”s were had by all. The release of The Last Exorcism Part II has us thinking about five other movies dealing with demonic possession in this week’s Watch This. We became ridiculously excited by the prospect of a Chris Rock/Dave Chappelle comedy tour, and learned that Bill Bellamy likes to wear all the clothes at the same time. Hey now! The Larry Sanders Show was one of the best sitcoms of the ’90s, as these 10 episodes prove just how effective it was. This week in Great Job, Internet! We saw a trailer for 1985’s Real Genius reimagined as an M. Night Shyamalan film. It turns out Val Kilmer’s facial expressions can be interpreted many ways. Hopes for a full Veronica Mars reunion were stoked when a candid shot taken at a hockey game found its way onto the Internet. We watched the super-meta new music video for David Bowie’s “The Stars (Are Out Tonight),” starring Bowie and Tilda Swinton as a married couple. This week’s AVQ&A discussed our favorite poems. Whether it be the lavish wordsmithery of William Shakespeare or ones that offer classic Simpsons references, we’re equal opportunity laureates here. See: If genuine chills are what you crave, Stoker has them in spades, avoiding all the pitfalls of the needless—and awkwardly titled—The Last Exorcism Part II. Read: Karen Russell expands her range with Vampires In The Lemon Grove, another book of excellent short stories. Listen to: Thom Yorke’s Atoms For Peace debut proves he still has plenty of life left in him, and plenty of new grooves courtesy of Flea. Watch: Enlightened is one of the best shows on TV, so catching up on that before its season finale this weekend would be a smart move. Plus it allows you to avoid another disappointing episode of Community.